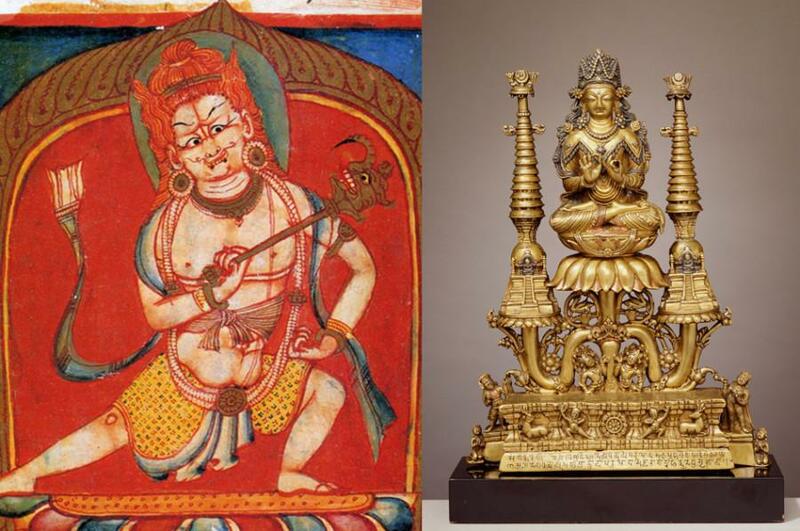 Block Museum of Art will display these two artifacts, a Crowned Buddha Shakyamuni statue and Thangka of Four-Armed Mahakala depiction, along with more than 40 others when the new exhibition opens Tuesday. An 8th-century brass sculpture with copper and silver inlay, a masterpiece of technical workmanship, sits in the middle of an empty room. The display isn’t located in the Metropolitan Museum of Art or The Louvre. Rather, it’s part of Block Museum of Art’s new exhibition, which includes two parts — The Collecting Paradise: Buddhist Art of Kashmir and Its Legacies, and Collecting Culture: Himalaya through the Lens — opening Tuesday. Prof. Rob Linrothe, who is curating the exhibit, said this physical set-up is an integral part of understanding the exhibition. The exhibition is split between two floors, one featuring art from the Kashmir region as perceived by the people of the West Himalayas. Linrothe said this floor shows how the different objects have been or can be displayed by different groups of people. The religious aspects of the art are prominent on this level, to reflect the way people from the West Himalayas have interpreted artifacts from Kashmir. The second part of the exhibition places the pieces in a Western context as seen through the eyes of Italian and American explorers, Block spokeswoman Joanna Gueller said. Block director Lisa Corrin said the exhibition was a departure from the museum’s past displays in that it features work from a different region. The exhibition features sculptures, photographs, textiles and other mediums. Since first conceiving of the exhibition to use in his teaching, Linrothe teased out the idea with the museum and the idea earned a National Endowment for the Arts grant, Block’s first ever. Linrothe said seeing the exhibition come to life has been a remarkable experience. The unique array of pieces features a region understood in a certain way by Americans, Corrin said. However, the Kashmir and West Himalayan areas can be viewed through a different lens at Block. In addition to the rare locational focus of the exhibition, Linrothe said its focus on how the artifacts actually arrived at the museum is a unique feature. “By exploring issues of collecting, we’re, if not breaking new ground, at least we’re moving in the same direction as a new movement in museum practice, which is to not pretend that these things just appeared in the museum by some accident of grace but that they were acquired, and sometimes by not very happy means,” Linrothe said.